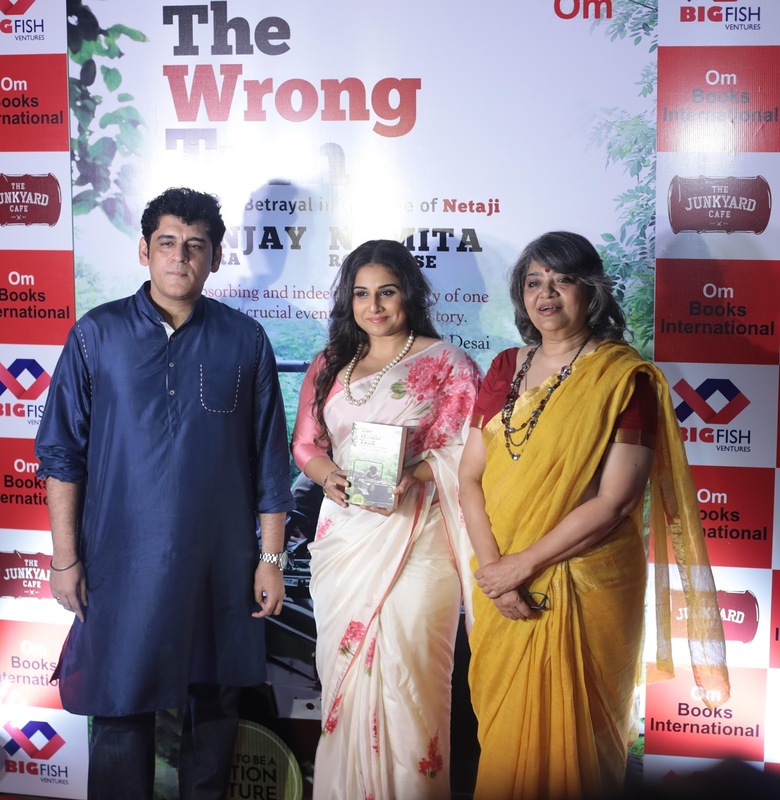 Vidhya Balan Launches great Kahaani ..
Mumbai, 1st March, 2017: Om Books International along with The Junkyard Café, Mumbai, celebrated the launch of The Wrong Turn: Love and Betrayal in the Time of Netaji by co-authors, Sanjay Chopra and Namita Roy Ghose, on 28th February 2017. Vidya Balan, Rajat Kapoor and Simone Singh read from the book. This was followed by an interesting discussion on the book by Sanjay Chopra, Namita Roy Ghose, Tigmangshu Dhulia, Arshad Warsi, Anil Dharker and Tisca Chopra. Other notable people present on the occasion were Maria Goretti, Sayani Gupta, Kavita Kaushik, Ranvir Shorey and Mushtaq Sheikh. SANJAY CHOPRA is an airline pilot and author of two collections of short stories, Said and Done and Tailspin stories. He believes that his office forty thousand feet in the sky and his travels provide him with a view that fuels his vivid storytelling that cuts a wide arc through time and space. I am blessed to receive much love and acceptance for The Junkyard Café in Mumbai. It’s overwhelming to see that in less than a span of 3 months, The Junkyard Café has become the favorite hangout spot for Bolly and Telly world. The Junkyard Café is a luxurious concept that derives its inspiration from Junkyard, a yard used to store junk. How junk can be utilized in the most beautiful way, is something that the café chain has mastered very well. The magnum place which stands true to its concept, welcomes you to a world that has best of interiors with minimalistic approach. The Mumbai units have been designed by deriving inspiration from vintage garage or old spacious industrial locations. With tires on the wall, scooters as seats, parking graphics on the wall etc., The Junkyard Café is an extremely unique concept and first of its kind in Mumbai. Lifelike images of Elvis Presley & Marilyn Monroe will adorn the walls of Mumbai café and take the guest into the classic Hollywood era. One of the largest English trade publishers in the Indian subcontinent, Om Books International is a force to reckon with. It has been a leading enterprise for more than five decades in the Indian publishing and retail industry. Headquartered in Noida, OBI has a diverse publishing list: cinema, biography, memoir, mind-body-spirit, photo essay, art, architecture, lifestyle, fiction - commercial and literary, to name just a few categories. It counts amongst its notable authors Khalid Mohamed, Mushtaq Shiekh, Bharathi S Pradhan, Nasreen Munni Kabir, Rauf Ahmed, Kamala Das, William Dalrymple, Christopher C Doyle and Suhail Mathur. Om Books International has a stellar lineup of Gourmand World Cookbook Award Winners: Saransh Goila, Maria Goretti, Michael Swamy, Mugdha Savkar, Shazia Khan, Aditya Mehendale and Vikas Khanna. Some of its forthcoming titles include: The Bachchans by SMM Ausaja, Asha Parekh: The Hit Girl by Asha Parekh and Khalid Mohamed, and Taj Mahal: Multiple Narratives, by Amita Baig and Rahul Mehrotra. OBI has an equally strong and varied children's publishing programme under its imprint, OmKidz.